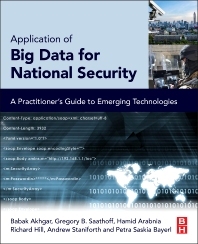 Application of Big Data for National Security provides users with state-of-the-art concepts, methods, and technologies for Big Data analytics in the fight against terrorism and crime, including a wide range of case studies and application scenarios. This book combines expertise from an international team of experts in law enforcement, national security, and law, as well as computer sciences, criminology, linguistics, and psychology, creating a unique cross-disciplinary collection of knowledge and insights into this increasingly global issue. How Different Is Big Data? What Is Meant by an Overarching Architecture? What Are the Challenges Involved in Big Data Processing?